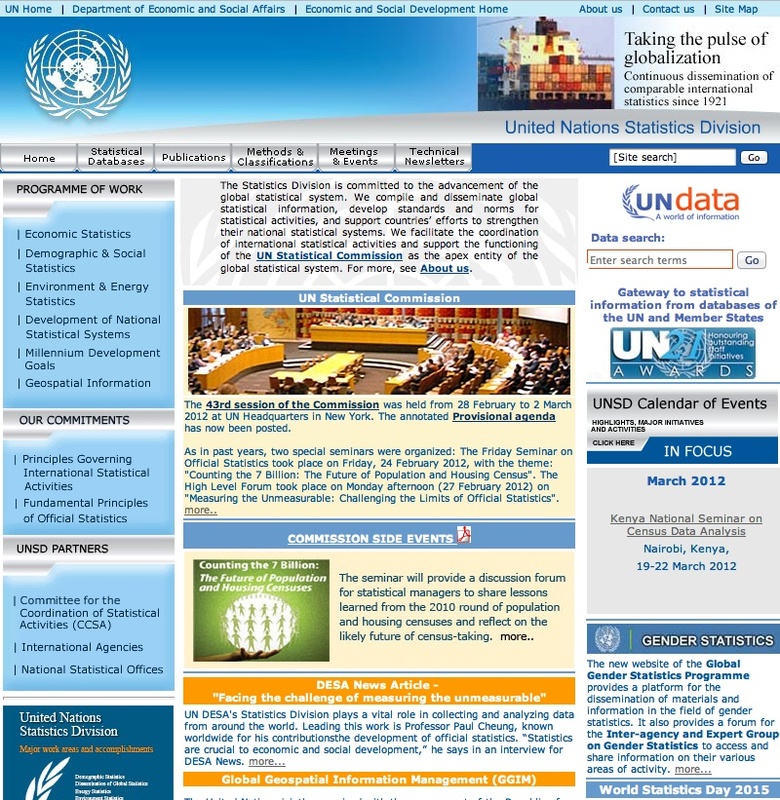 The UN Statistical Division is a section of the UN official website, entirely dedicated to statistical data. More than fifteen complex databases are available on-line, made up of surveys produced by the UN and by other major international agencies. They cover a very wide range of topics related to the overall activities of the UN and, virtually, all the regions of the globe, offering a huge amount of detailed statistical data, concerning demography, development, international trade, health, education. The site is not entirely free, yet non-subscribers can access many areas and view several data. The freely accessible databases are structured mainly by links and topics, while those reserved to paid subscribers are endowed with a comprehensive search engine, which can also be used by non-subscribers in a restricted version. The subscription fee policy is more favorable for developing countries, non-profit organization, and public libraries. Governments have free access. Fees are on an annual base; no pay-per-use is allowed. The whole site architecture does not appear so intuitive, mostly due to the scarcity of navigational aids. offer access to a variety of demographic, economic, political and social statistics. Data generally belong to institutions specialized in the digital acquisition and preservation of data for social sciences and humanities (mainly data produced by official agencies, international statistical societies and market research organizations). An example of such an institution is the German Zentral Archiv, which is one of the richest European databanks, open and free for navigation and search. The bulletin of the International Political Science Association. The IPSA Journal, with five issues per year. abstracts with worldwide coverage and perspective. The IPSA World Congress of Political Science, July 23-28, 2016.